Uyghurs say Chinese companies are passing goods off as halal products imported from Muslim countries. The products with foreign labels marking them Islamic-compliant are popular among Uyghurs who distrust the certification by China’s state-run Islamic body, sources in Xinjiang said. One company contacted by RFA Uyghur Service, Tianren International Ltd., admitted it had been producing food products domestically and mislabeling them as certified halal goods from Malaysia, a predominantly Muslim country. “Our company was set up a long time ago and has grown to a large scale. We mainly produce halal foods for the whole Xinjiang region and net hundreds of thousands to several million yuan [annually],” or hundreds of thousands of U.S. dollars, said the company’s director, surnamed Luo. “We label our foods as a Malaysian brand and mark them halal, but most of the halal foods we send to Xinjiang are produced in our factory,” she said. “We have a large market in Xinjiang,” she said, referring to the region’s 9 million mostly Muslim, Turkic-speaking Uyghurs. In a follow-up call, Luo said that her company makes its food using halal ingredients, although she refused to provide details on how production was monitored. An investigation of the address listed on a Tianren International product label for its office in Malaysia found a personal storage facility and not a food processing center. Tianren had been singled out on an online forum by Uyghurs as one of two companies said to be mislabeling products as coming from Muslim countries with exacting halal guidelines, when they were in fact being produced in China. Officials at Albert Lim Imports could not be reached for comment, but the company’s address in Malaysia was found to be an auto garage. Sources within Xinjiang said that the number of food products that claim to be imported from abroad has increased recently and that such goods were in much higher demand than similar items known to be made in China. They said that because China is not a Muslim country, Uyghurs distrust foods produced there, even when they are labeled as halal. In China, halal foods, which play a significant role in Uyghur culture, are only produced in factories which have special permits from the government by the approval of the official Islamic Association. Non-food products, such as pharmaceuticals and cosmetics, are also are subject to halal standards. Chinese companies importing “halal foods” from Muslim countries such as Malaysia are not vetted by the Islamic Association, and Uyghur sources said they would not trust the halal standards of the association even if they did. There has also been a tendency for Uyghurs to boycott Chinese products following the July 2009 ethnic violence between Uyghurs and Han Chinese in the Xinjiang capital Urumqi that left nearly 200 people dead according to official reports. 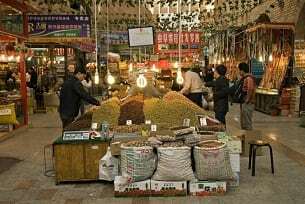 Sources in Xinjiang confirmed that food items believed to be halal and imported from abroad are more popular among Uyghurs, even when the ingredients labels are only in English. One Uyghur youth said that one of the most sought-after products are imported energy drinks, particularly among the younger generation. “Of course we are going to buy the ones made in Muslim countries, even if it is expensive, because it’s more credible [as a halal product],” he said. “We bought the Chinese-made drinks before too, but not much,” he said. But a Uyghur businessman who acts as a middleman in Urumqi for a Chinese importer of energy drinks said he was surprised to learn that domestic companies were mislabeling their products as coming from Muslim countries. “Did they really say that?” he asked after being informed that Tianren International had admitted to producing its food items at its factory in China. He said that he was confident the products he purchased for resale in Urumqi were legitimately from Malaysia. “The company I have contact with in China has a branch in Malaysia. [I know] because I … talked with them,” he said. But he admitted that if he were to purchase halal products that were produced by Chinese companies “it would be cheaper” than importing them from Muslim countries. “Imported halal foods are more expensive than those that are not imported,” he said. Even Uyghurs who do not strictly adhere to Muslim halal standards are often willing to pay a premium for foreign goods rather than give their money to Chinese companies, sources said. They said that Chinese companies are merely cashing in on the Uyghur community by labeling their products as foreign and halal in an effort to draw in a larger market share. But Uyghurs have been barred from the same market, they said. Members on the online forum that complained about Tianren’s fake products expressed frustration that only a handful of Uyghur companies—such as importers Arman and Ihlas which are owned by Turkish Uyghurs—had been given permission by Chinese authorities to import food products from abroad. Aside from demanding more Muslim-led companies in the region be allowed to source goods from abroad, Uyghurs have also called for tighter controls on “halal” products that are made in China. But the Uyghur community has very little power to exercise consumer rights in China, Charles Burton, a senior consultant on Chinese affairs to agencies of the Canadian government, said. “A lot of this has to do with bribery of food inspectors and corruption by the companies which are selling items that are not as they are described on the packaging,” he said. “It is terrible for Muslims to buy food which they believe is halal, but actually is not,” Burton said. “The sad thing is that Uyghurs have very little power and lack the connections to exert influence on behalf of their group,” he said. Reported by Rukiye Turdush for RFA’s Uyghur Service. Translated by Rukiye Turdush and Mamatjan Juma. Written in English by Joshua Lipes. « Opinion: Can vegans stomach the unpalatable truth about quinoa?